This is “Introducing the Realm”, section 12.1 from the book Regional Geography of the World: Globalization, People, and Places (v. 1.0). For details on it (including licensing), click here. Summarize how colonialism has affected the development and socioeconomic conditions of Australia and New Zealand. 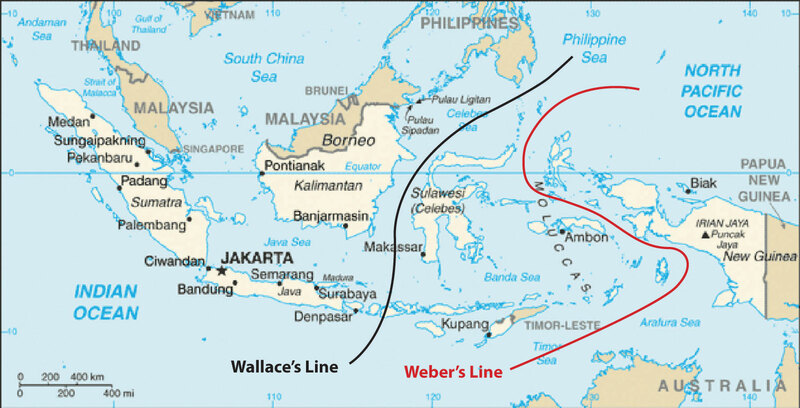 Determine where the Wallace Line and the Weber Line were located. Understand how isolation has allowed for the high level of biodiversity. Outline how colonialism impacted the Maori and the Aboriginal populations. Wallace’s and Weber’s Lines were developed independently to account for the differences in biodiversity between the Austral realm and the Asian realm. Scientists continue to analyze the true boundary between the realms. These lines demarcate a clear environmental difference in species development between the two sides. The historic isolation of New Zealand and Australia from the rest of the world has caused animals and organisms that are not found anywhere else to develop in these two countries. The unique biodiversity includes marsupials, or animals whose young are raised in the mother’s pouch, such as kangaroos, wallabies, koalas, and bandicoots. It is believed that these creatures developed separately after the continents broke away from each other more than two hundred million years ago. Many plant species are also unique to this realm. The biodiversity found here is separate from that of Asia. This has been explained by various biogeographers by drawing imaginary lines just north of Australia to indicate the line of division between the Asian realm and the Austral realm. Wallace’s Line and Weber’s LineImaginary lines drawn on a map through Indonesia demarcating the separation of plants and animals between the Asian realm and the Austral realm, which accounts for the uniqueness of the flora and fauna of Australia and New Zealand. are two such examples. Both examples attempt to establish the correct line of demarcation for the differences in species development between the two sides. During the ice ages, sea level was lower, and the many islands of Southeast Asia were connected by land to the mainland. Papua New Guinea was connected to Australia. Wallace and Weber believed that no land bridge connected the Asian side with the Austral side for animals to cross over. This separation caused the organisms to the south to develop independently of those in the north. For example, marsupials are not found on the Asian side of these lines but are found on the Australian side. New Zealand and Australia were both inhabited before the era of European colonialism. Aboriginal people are said to have migrated to Australia across Southeast Asia from the mainland of Asia more than forty thousand years ago. They made Australia their home and adapted to the physical geography of the continent. For tens of thousands of years before the Europeans arrived, the Aborigines carved out an existence in Australia and developed their cultural ways. Only about four hundred fifty thousand Aborigines remain in Australia today. New Zealand was inhabited by the Polynesian group called the Maori who established themselves on the islands in the tenth century. For hundreds of years they, too, established their culture and traditions in the region before the Europeans arrived. The Aborigines in Australia and the Maori in New Zealand were both confronted with the European invaders. From their standpoint, there was much to lose by the arrival of the Europeans. Lands were lost, new diseases killed many, and control of their methods of livelihood were taken over by Europeans. The Maori initiated a number of wars against British colonizers, but in the end the greater military power gained the advantage. At the present time, the Maori make up less than 10 percent of the population of New Zealand. The sighting of Australia by the Dutch dates to 1606. Portuguese explorers may have discovered Australia earlier, but there are no written records. In the early 1700s, the northern and western coastlines of Australia were known as “New Holland.” There were no established colonies. James Cook, a naval officer working for the British navy, commanded the good ship Endeavor and mapped Australia’s eastern coast in 1770. He made port at Botany Bay, just south of the current city of Sydney and claimed the region for Britain. He named the land New South Wales. The charting of the coast resulted in continued attention being paid to the region. Meanwhile, England had a severe problem with overcrowding of its prisons. Its problem was exacerbated by the loss of Britain’s American colonies. Upon Cook’s return to England, interest was generated in the concept of relieving prison overcrowding by sending prisoners to Australia. In 1787, eleven ships with seven hundred fifty convicts sailed from Great Britain to Botany Bay. Prison colonies were established in Australia. By the end of the seventeenth century, the entire Australian continent was under the British Crown. At the same time that the movement of prisoners from England to Australia was diminishing, the next wave of immigration was being fueled by the discovery of gold in the 1850s. The practice of transferring prisoners to Australia ended in 1868. The arrival of the Europeans had caused a serious demise in the Aboriginal population. Aborigines were completely decimated in Tasmania. 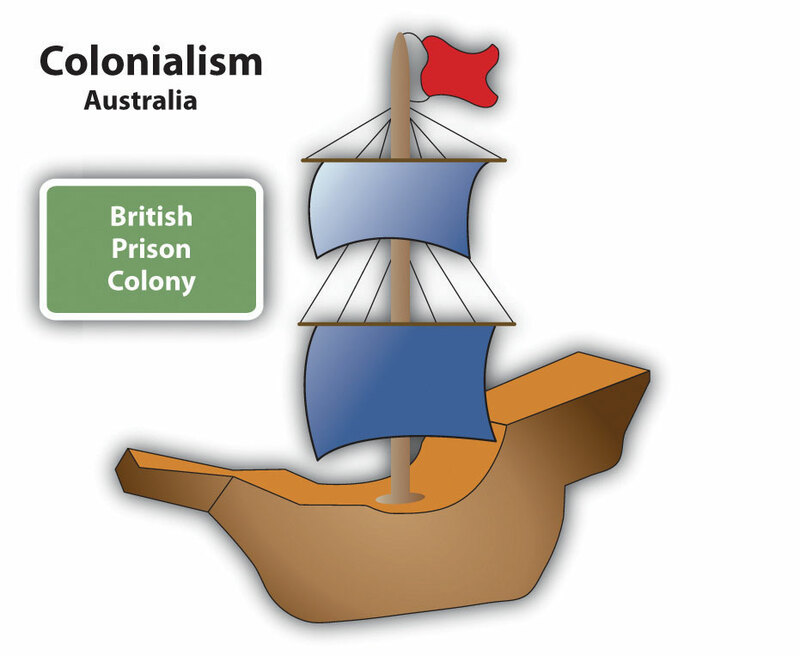 Great Britain colonized Australia by establishing prison colonies. The prison colony of Botany Bay was located near the current city of Sydney, Australia. In 1901, the various territories and states of Australia came together under one federation called the Commonwealth of Australia. A new federal capital city of Canberra was proposed. By 1927, Canberra was ready for government activity. This commonwealth government still allowed for individual state differences. The British monarch is considered the head of state, though it is mainly a ceremonial position. There have been movements within Australia in recent years to separate from the British Crown, but they have not been approved. Australia has a democratically elected government. British naval officer James Cook mapped the coastline of New Zealand in 1769. As the colonial era emerged, Great Britain took possession of New Zealand and included it with its colony of New South Wales. In the 1840s, New Zealand became a separate crown colony. The colony developed a local parliament and a representative government. By 1893, New Zealand made headlines as the first country in the world granting all women the right to vote. As a part of the British Empire, the country was made a commonwealth nation in 1947 and has been functioning independently ever since. Australia is an island continent that was home to aboriginal people who have lived there for tens of thousands of years. The British colonized Australia by first creating prison colonies for convicts from Great Britain. New Zealand has two main islands and is home to the Maori, who were originally from Polynesia. The British colonized New Zealand and often were in conflict with the Maori. Australia is relatively flat with low elevation highlands and an extensive dry interior, while New Zealand has high mountains and receives adequate rainfall. The Austral realm was isolated by physical geography. Weber’s Line and the Wallace Line were attempts to distinguish the location of the separation between biological environments. For what purpose was Australia first colonized? What European country colonized Australia and New Zealand? How did the colonial activity impact the indigenous people? How is the Austral realm isolated from the rest of the world? Who are the main indigenous people of New Zealand and where did they originally come from? Explain how the colonial development of Australia was similar to the colonial development of the United States.